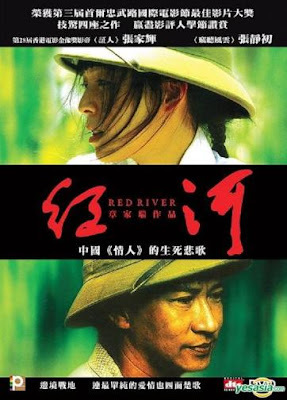 I'm surprised that the guys at LoveHKfilm.com have not already tackled this, so here goes with my review of Red River (2009), the reteaming of Nick Cheung and Zhang Jingchu from the acclaimed The Beast Stalker. As readers here are aware, I was quite pleased with that film. So, what about Red River? The film opens in Vietnam in 1973. A young girl, Tao, loses her father in a war-related accident and we then flash-forward to 1997 somewhere on China's border with Vietnam (the subtitles don't reveal where). Tao is now an adult, played by Zhang Jingchu, and she's sent to work at a massage parlor. In a nice shot, she and her girlfriends/coworkers look down from their balcony to the busy street below where we meet Nick Cheung's Xia, a karaoke stall operator. The next morning, as the camera pans through Xia's apartment, we hear Chinese opera playing on the stereo, and we see pictures of traditional Peking Opera performers on the walls. Xia is paying a prostitute her fee after a night's work despite reminding the girl that she said she loved him the night before. Nick Cheung brings a lot of vulnerability to this scene and it's quite refreshing after his violent and psychopathic turn in Election. At the massage parlor, Tao works as a maid and, in a poetic bit of film business, ends up servicing Boss Sha Ba (Shaw Brothers legend, Danny Lee) after the other girls are afraid to. Boss Sha Ba bears the wounds of his fight against the American troops, including a metal leg and scars and shrapnel wounds. He leaves pleased after an apparently non-sexual massage from the dim Tao. The madam of the place, Shui (played by Hong Kong cinema mainstay Loletta Lee), sends Tao out for food and lets the girl keep some of her money from Boss Sha Ba. When next we see her, she runs into Xia when hiding during a police shakedown of the massage parlor. Due to a similar mole on Xia's forehead, she thinks he is her father -- or at least calls him "Papa" when seeing him for the first time. Soon, in another bit of nice, but somewhat contrived, film business, Tao is singing at Xia's karaoke stall and her voice is so good that Xia is next buying the girl's services from Mamasan Shui, who offers the caveat that Xia needs to take care of the girl's food and lodging. She also warns that Tao is still a virgin, which is not surprising since the audience is already aware that the girl is a bit slow mentally. Soon, Xia is charging money to passersby to sing with Tao at his street-level karaoke stand and his business is booming -- low level hoods stop on the street to pay to sing with the sweet and smiling girl. You know, this kind of film is exactly why I like watching films on DVD! The scenes of Nick Cheung and Zhang Jingchu practicing karaoke -- if I only knew the songs they were doing!-- on a rooftop overlooking the Chinese countryside are so good and precious that it actually helps me enjoy the film if I hit "pause" and run to the bathroom or go get a soda as it feels like I'm prolonging the magic of the story. And I say that because as a viewer this is the kind of film where I just dread the ending; I know I'm going to see Tao's kind heart crushed by circumstance, or something like that. I should also note that the film is borderline melodramatic, though still naturalistic in its presentation of these moments, and the lack of an intruding soundtrack helps the viewer in the enjoyment of the unaffected drama between these two lonely characters. And it doesn't hurt that Nick Cheung is playing a relatively nice guy. 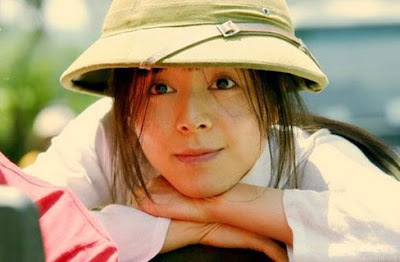 And Zhang Jingchu is just marvelous -- almost comical without reducing Tao to a bumbling stereotype of a character. Tao is not a magical retard like Forrest Gump, nor is she some shambling collection of acting tricks like Dustin's Rainman; she's just a bit off, somewhat slow and perhaps emotionally dazed following her father's death. But then, Xiao Yue, Xia's former lover, is back in town. Xia reveals how he lost the woman, his former partner in a Yunnan Opera troupe, in an amazing sequence that borders on the histrionic but, given my affection for the two actors involved, becomes spellbinding and simple and real. Piecing together clues from the film, the viewer learns that Xia is of the Yao minority from somewhere in the Kunming Province, a fact that will be central to the plot later on. After a comical misunderstanding, the couple are apart with Tao seeking refuge with Danny Lee's Boss Sha Ba and Xia longing for his former employee/housemate/partner. But, not long after seeing proof of Boss Sha Ba's wickedness and the frightened Tao is making her escape. Xia gets beaten up as the guys who work for the Boss look for Tao and her old mamasan, Shui, doesn't seem to know where she is either. A lonely and now dejected Xia makes his way to the countryside for a wedding celebration in his old village. Needless to say, without surprising many viewers, Tao joins Xia in schlepping his karaoke equipment out to the countryside for the traditional festivities in Kunming Province. I'm not going to reveal any more of the plot. I can't say I was totally surprised as it unfolded -- surprised in small ways maybe. This is the type of film where you get the feeling of how things will progress. And if I was going to seriously critique the film, I'd say that it's a bit too forced in the "big" moments of the plot. As I prefer a kind of naturalistic storytelling -- when I'm not watching mainstream Hong Kong features, or old Shaw Brothers costume dramas and musicals, that is! -- and Red River would have been a minor masterpiece without those bits of high drama that propel the story forward. As it is, the addition of those moments is why I hesitate to recommend the film for everyone; a cynical viewer would have points to make that I couldn't exactly argue against. Still, if you like these two performers -- both at the peak of their careers -- you will be richly rewarded by spending 99 minutes with them here. I would have been happy if the whole film had been just about the couple's courtship, with or without the other stuff. And it's worth noting how much Loletta Lee and Danny Lee do with so little. That's not to say that their parts are underwritten but, when compared to a similar role assayed by Tony Leung Ka-Fai in Lost in Beijing, Danny Lee is masterfully underplaying his "villain" role; Boss Sha Ba remains human and not a "bad guy" stereotype. Loletta Lee still looks great and she has one great scene with Nick Cheung that reveals a bit of her character's vulnerability. The DVD features a 1-hour, 5-minute "making of" segment that is essentially behind-the-scenes footage of the film production. No English subtitles, unfortunately. And there's a 5-minute press conference/premiere segment as well. Again, no English subtitles. You can order Red River on DVD here.